Black Box Stocks Review 2019 – Is This Market Scanner Worth It? ​When you open a ‘black box,’ all of the unknowns start to make sense. For Blackboxstocks, it claims it can provide the same revelations about the equity market. 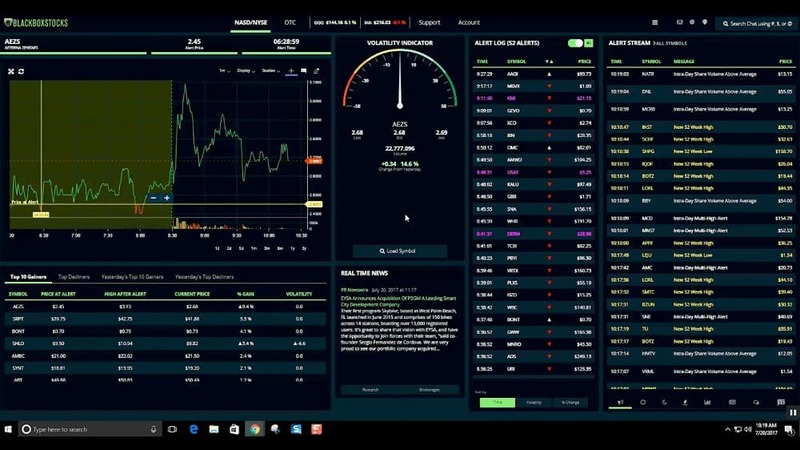 Combining proprietary trading algorithms with advanced artificial intelligence, this trading software service uses some of the same technologies perfected by high frequency traders (HFTs) on Wall Street. But is the technology legit? In this Blackbox stocks review, we’ll break down all the company has to offer and let you know if its subscription plans are worth the price of admission. Who is Black Box Stocks Best For? Blackboxstocks is a software provider that combines proprietary algorithms and artificial intelligence to exploit inefficiencies in the equity and options markets. Founded in 2011 by Partner Eric Pharis, the company locates its data servers directly near the NYSE, NASDAQ and OTC exchanges to avoid trading latency. When running the software, the platform combines predictive technology with advanced artificial intelligence to help discover unusual market behavior and increasing volatility. Its institutional grade analytics plug-ins help subscribers uncover unknown market trends and alert users of potentially large price swings. For subscribers, Blackboxstocks provides an easy-to-apply dashboard that includes real-time alerts, stocks scans, news feeds, as well as a fully interactive chart and social medial platform. The community app also allows users can exchange information, discuss strategy and communicate efficiently through its common network. Blackboxstocks offers subscription plans to its proprietary technology as well as educational webinars to help enhance user experience. With two options to choose from, Blackboxstocks offers monthly and annual subscription plans that include full access to all of the software’s features. And what’s included in your subscription? As you can see, Blackboxstocks has a lot to offer. But how does its technology actually work? Well, what separates Black box trading software from other competitors is its algorithms automatically post alerts to let you know when an explosive opportunity is taking place. More importantly, the alerts are in real-time. With its servers located so close to the exchanges – you’re always first to know. See it all start pre-market. Before trading begins, Blackbox’s scanner scours pre-market activity to uncover the most active stocks and options. Next, it analyzes volume and sentiment behavior to decipher which stocks are prime for the largest breakouts. Once an alert hits the wire, the platform also provides detailed information as to why a stock received an alert and what triggered the algorithms attention in the first place. Made up of high-speed servers that monitor over 13,000 stocks in real-time, Blackboxstock’s algorithms can analyze each stock tick multiple times per second. Similar to the technology used by high frequency traders (HFTs), Blackboxstocks’ system helps level the playing field by providing you with the same technology as those used by large financial firms, hedge funds and Wall Street’s elite. But Blackboxstocks doesn’t stop and just stocks. With Blackboxstocks options scanner, you can follow the ‘smart money’ and gain insight into what institutional investors are thinking. Now, when it comes to options trading, open interest is extremely important. It tells you the amount of option contracts that are yet to be exercised and thus, still available for trading. Because increased trading activity leads to supply and demand imbalances; which in turn, moves option prices. With Blackboxstocks option software, you’ll know exactly when activity is picking up and the best way to exploit it. With its community platform, there are also plenty of benefits there as well. Like other forms of social media, the Blackboxstocks mobile app allows you to watch traders live, discuss trading ideas and discuss strategy. You can also use the fully integrated social media features to follow, direct message and subscribe to other members channels. Another additional benefit is access to Blackboxstocks’ member’s only TD Ameritrade commission rates. As its preferred trading platform – thinkorswim – the offer combines both reputable service and lower costs. To answer, it really depends on the size of your trading account. Unfortunately, Blackboxstocks does not offer a free trial for any of its technology. So at nearly $1,000 a year, you need to book enough winning trades to justify the subscription costs. For those with large bankrolls, the outflow is rather small. If you trade in the $10,000 range, you can breakeven with a single 10% gain. A second issue is volatility. Blackboxstocks’ strategies look to exploit explosive stocks that are prime for breakouts; however, most of these issues have low share prices and low float. The large price swings are a function of small-cap stocks with a low supply of shares outstanding. While these offer the best opportunities for extensive profits, make sure you’re comfortable with the large price swings. From our perspective, we’re mixed on Blackboxstocks. Without a free trial, it’s hard to truly gauge the validity of Blackboxstocks’ technology. However, if you’re interested in giving the platform a try, we recommend enrolling in the $99.97 a month option. This way, you can test out the service for a reasonable time period without locking in a long-term contract. Second, it offers you the opportunity to cancel anytime if the algorithms don’t perform as promised. Moreover, a month will provide plenty of time to gauge if the product is right for you. And with a one-time cost $99.97, you won’t break the bank in the process. Included free of charge for all Blackboxstocks subscribers, the Blackbox Bootcamp Class is a 3-hour introduction to stocks, options and the Blackbox system. The course is designed to help take your trading skills from the basement to the penthouse. What is “short selling” and what are the risks? How Blackbox alert systems work – pre-market, volume, price spike, rapid decline, etc. As an additional bonus, it’s great that Blackboxstocks offers education in combination with its data analysis and algorithmic trading tools. As mentioned, if you’re interested in giving it a try, signing up for the boot camp is a great add-on to help increase your skills in the process. Unfortunately, Blackboxstocks does not offer a free trial for either of its subscriptions. From our point of view, it’s important to allow prospective customers to validate a service before requiring a full purchase; hopefully – in the future – the company will change its stance on this matter. As another feature, Blackboxstocks does offer plenty of free trading resources through its Blackboxstocks Blog. There you can read investor articles such as Options Heat Maps, Options Dollar Flow as well as Bullish Flow and Bearish Flow. You can also follow the team on its official Blackboxstocks Twitter, Blackboxstocks Facebook and Blackboxstocks YouTube pages. Whatever your skill level, Blackboxstocks can help improve your trading game. By combining algorithmic trading with advanced artificial intelligence, Blackboxstocks’ technology removes emotion from the equation and allows its indicators to focus solely on the data. For new traders, this approach can be quite beneficial as you try to figure out what’s happening in the overall market. For advanced traders, it can also provide immense benefits. Like having two sets of eyes on one computer screen, you can combine Blackboxstocks’ algorithmic features with your own in-depth trading knowledge to help create a profitable balance between advanced statistics and intuition. However, since Blackboxstocks does not offer any free trial, you should consider taking a look at some competitors like Trade Ideas and VectorVest first before making your final decision. With positives and negatives on both sides, we’re on the fence when it comes to Blackboxstocks. Without a doubt, the company offers advanced data tools and algorithmic features that are necessary for any trader to succeed in the market. Speed is at the forefront of trading success and with its advanced technology, Blackboxstocks’ algorithm can scalp valuable information much more quickly than any human. On the other hand, the company does not offer a free trial for its service. When gauging the validity of any technology, a company should allow customers to test out the product before requiring a full purchase. By not doing so, Blackboxstocks’ misses the mark here. All in all, if you are interested in giving it a try, our advice is stick with a $99.97 monthly subscription. With it, you can test out all of the software’s features and know if it truly adds value before making a full commitment. As well, all subscriptions include free access to the Blackbox Bootcamp Class. This 3-hour online webinar provides plenty of useful advice on stock trading, options trading and how to best use its proprietary Blackbox System. Alternatively, go for the free services Trades Ideas provides first and compare both services. The chances are that you are better served with Trade Ideas Pro since their strategies and algorithms are not a black box at all.